Wow! I never knew abt this... must be healthy one too rite???? can u tell me abt its values? 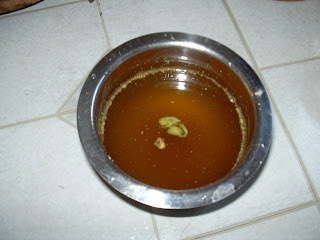 They used to serve this drink during festivals in Amman temples during summer season. It brings down our body heat and helps in preventing chicken pox during those summers. Thanks for sharing this wonderful drink. I was planning to do this the FIC: Brown event and you beat me to it. We too make panakam as naivedyam at festivals..
Thats a gud one..thanks for sharing the recipe...its something like ppl drink during cold/flu too rite? Thanks guys for the comments and Thanks Radhika for explaining the facts about this drink. I am not sure Priti, whether people like to drink this when they have cold or flu cos it won't be hot. This drink should be made with plain water and not with warm or hot water. Vidhya, thanks for participating. We generally make it for Rama Navami, and I like it very much - the flavor of chukku is something I just can't get over! You reminded me of Ramanavi dear..we make this on that occassion. It is really looking nice. Will try it soon.